I felt ecstatic though my body was tired. There was growing pain in my left ankle (from the fracture last year) yet my eyes twinkled with joy. A thousand steps or more but the views all around were worth it a hundred times. While it still feels that it happened yesterday, its been a week already when I made it to the top of Paro Taktsang or Taktsang Palphug Monastery, the holiest monastery in Bhutan. Famously known as Tiger’s Nest or Tiger’s Lair, the ascend was no less a feat for someone like me who is known to thrive in luxury travels. 4 other travel bloggers from Delhi (who traveled with me to Bhutan) often teased me for being the pampered one. All of them had past experiences from trekking in India except me. No doubt, I was scared but I was very serious to complete this ascend. On the D-day, we kept encouraging each other and successfully completed the trek as a gang. No doubt, the Himalayan Kingdom is small but it is amazingly impressive. It is scenic. It is peaceful. And best of all, it is still un-spoilt, non-commercial and far from the maddening crowd. Blessed with dramatic landscape, it has it all from beatific valleys, pristine countryside, temperate forests to alpine pastures. The grand views of majestic mountains make it no less than a natural paradise. 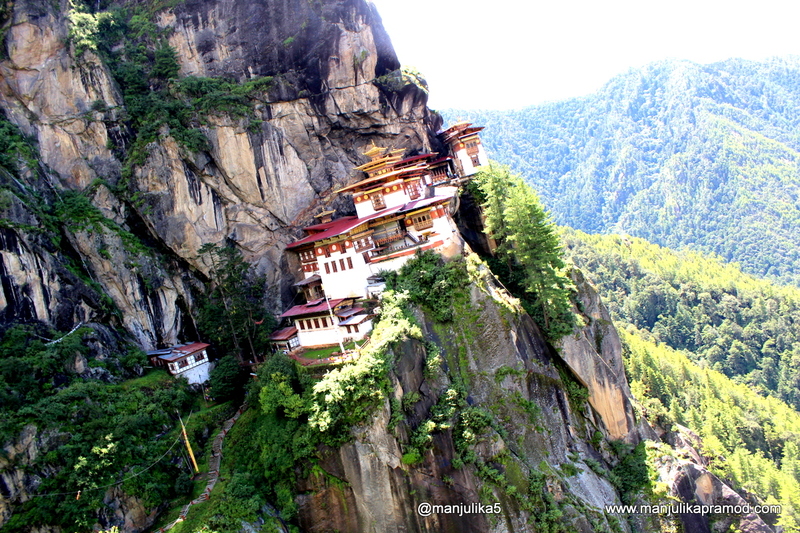 I wouldn’t shy in accepting the fact that I was both shocked as well as surprised to see Bhutan and its hidden colors. 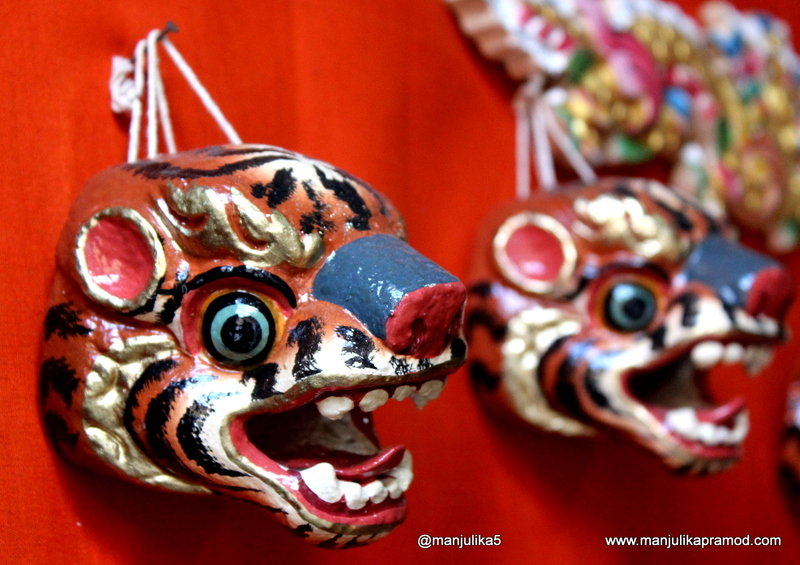 My eyes were fascinated by the exquisite craftsmanship showcased in its houses and monuments. Ask anyone who has been there and I am sure they would say that one of the main attractions of Bhutan is its unique architecture. The country thrives in its architectural heritage where Dzong (fortresses), Lhakhang (temples) and monasteries decorate the country unpretentiously. Built in perfect harmony with the environment, every architecture in Bhutan adheres to certain parameters. I still can’t forget those artistic curves and bends of every house on the streets, mural paintings in the smallest of the houses or the phallus symbols around Chimi Lhakhang in Punakha. Well, you might be tempted to fly to one of the most beautiful and only international airport at Paro, but I would say road trip from India is also quite a fulfilling and thrilling way to explore Bhutan. We took a flight from Delhi to Bagdogra and crossed over to Bhutan through the border town of Phoentshilling. 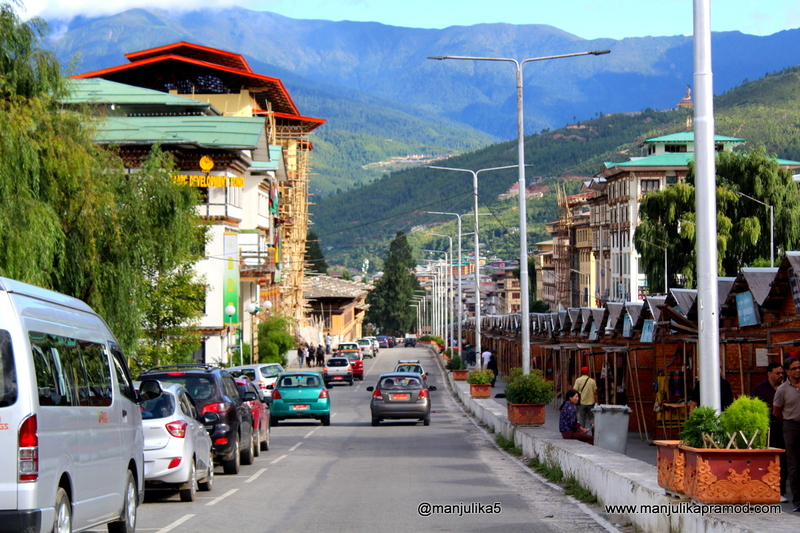 Our first night halt happened at Phoentshilling and next day we drove to the capital Thimphu. With no traffic lights in the capital city Thimphu and no jams to make you wait, the roads all over the country inspire to keep moving. To add to your convenience, the hand-painted signboards at every nook and cranny will keep reminding you to drive carefully. By the end of the first day, I was quite impressed with some of the amusing messages on the roads. As I traveled from one city to another, I can also say that in future more comfortable road drive is promised across Bhutan as a lot of road widening work was in progress. 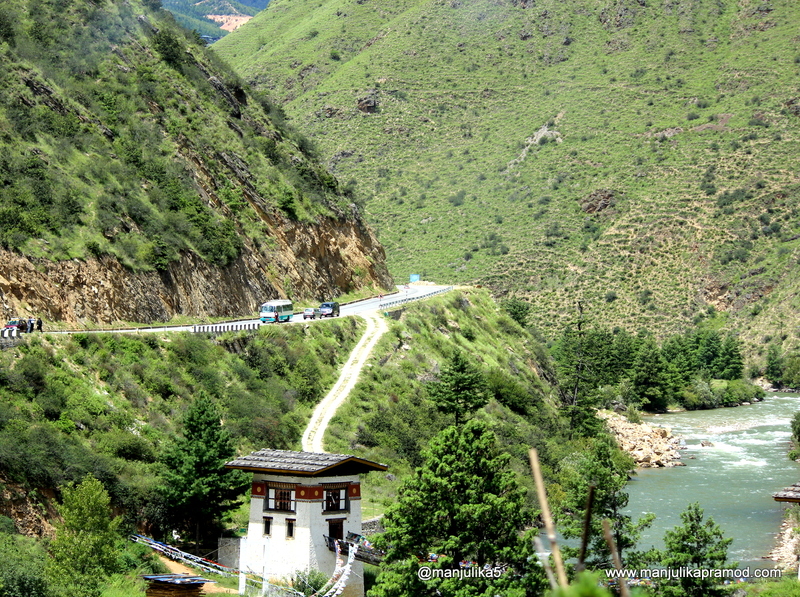 Roads in Bhutan are a great way to discover the country. The power packed itinerary of my 9 days FAM trip to Bhutan was an absolute treat for the travel blogger in me. While we covered three major cities of Bhutan- Thumphu, Punkaha and Paro, my lungs also got a chance to breathe in the the purest of air at Haa valley. Apart from living in different properties each day, we sampled lunch and dinner at the crème de la crème of Bhutan. And if you thought the biggest high of this trip was trekking to Tiger’s Nest, I must tell you that night camping by the riverside of Mo Chu, one of the prominent rivers of Bhutan was equally adventurous for me. It was my first time and I was uncomfortable initially. The other fun thing that happened was raft trip down the Mo Chhu River near Punakha. Rapids makes me nervous but this was an easy and smooth ride, just the kind that I wanted to start-with. The beautiful terrain along the river was a cherry on the cake. Another significant day of the trip was when we walked through the valley and agricultural fields of mustards and rice to a hillock that houses the famous Chimi Lhakhang. Last but not the least, this was the first time that I celebrated India’s Independence day in a different country. For us, it was not about hoisting our Indian flag but about expressing and living our freedom through our passion. Bhutan’s masked dance festival is very famous and is called tsechus. Bhutan is strategically located at the border between China and India. 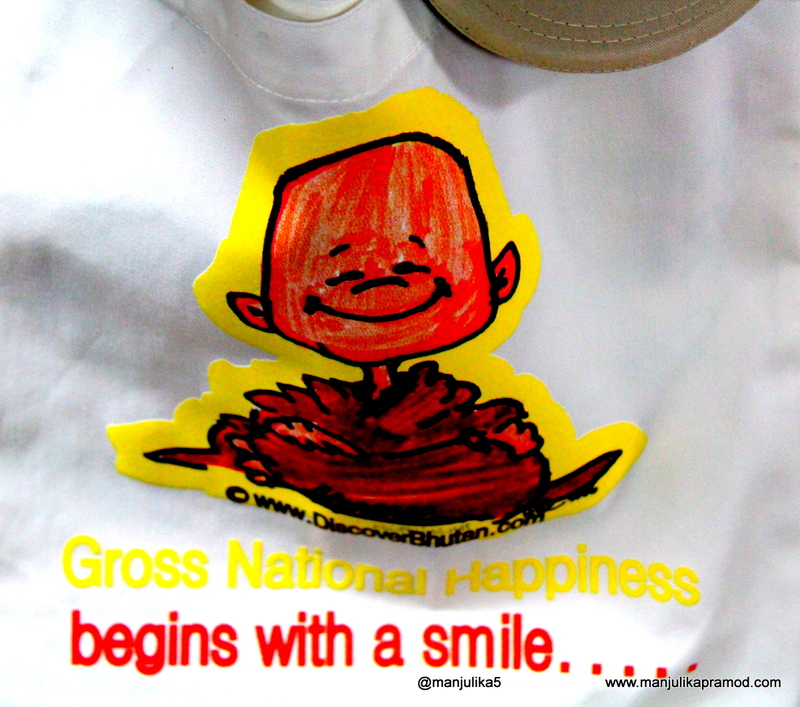 The country measures its development, its people’s well-being through Gross National Happiness. Dzongkha is Bhutan’s national language. If Buddhism fascinates you, this is the country for you. Do not be shocked when you find phallic symbols painted on the walls of houses and in temples and other monastic bodies in Bhutan. No big shopping brands and no Mc. Donald’s, KFC or Starbucks. The national dish for Bhutan is Ema datshi made with chilli peppers and cheese is served with almost every meal. No self trips allowed. One needs a registered tour operator to help you plan your trip to Bhutan. Also apart from India, Bangladesh and Maldives, tourists from all other countries have to pay a minimum tariff of $250 a day. I was really happy to learn that the sale of cigarettes is banned throughout the country. In 2015, Bhutan had booked a place in Guinness World Record by planting 50, 000 trees in one hour. 108 is a very lucky number in Buddhism and therefore in Bhutan too. I am not saying this after visiting the Dochula Pass which has 108 chortens (stupas) but after seeing little practices associated with 108. 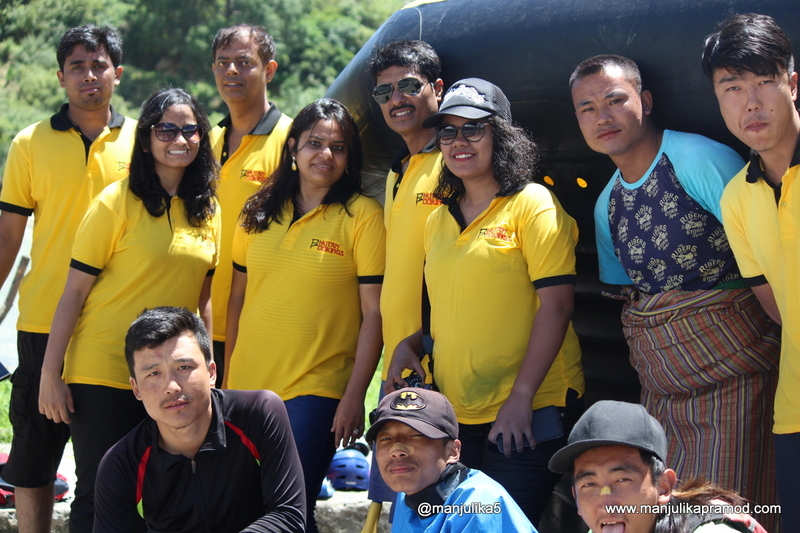 After the thrilling rafting session. Last but not the least, I must thank BHUTAN BOOKINGS for giving me this wonderful opportunity of discovering Bhutan on a fully sponsored media trip. 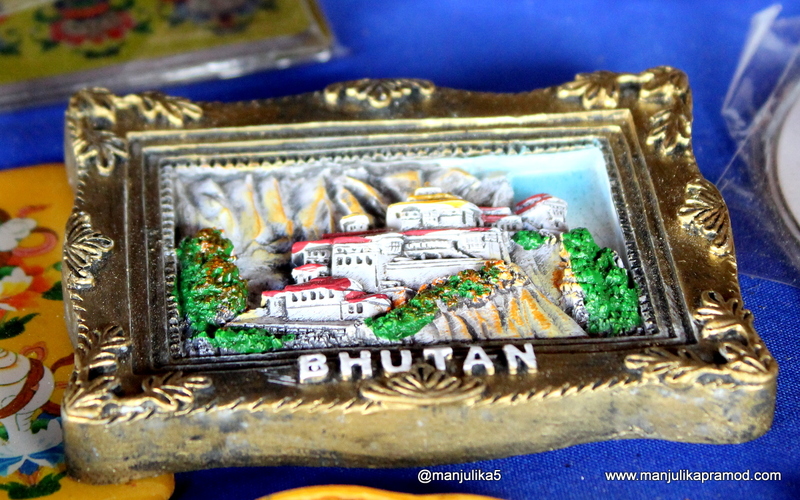 Keep following #happybhutan and #travelpals for my live feed of Bhutan trip. Loved reading your experience. I would also like to do the trek and river rafting! 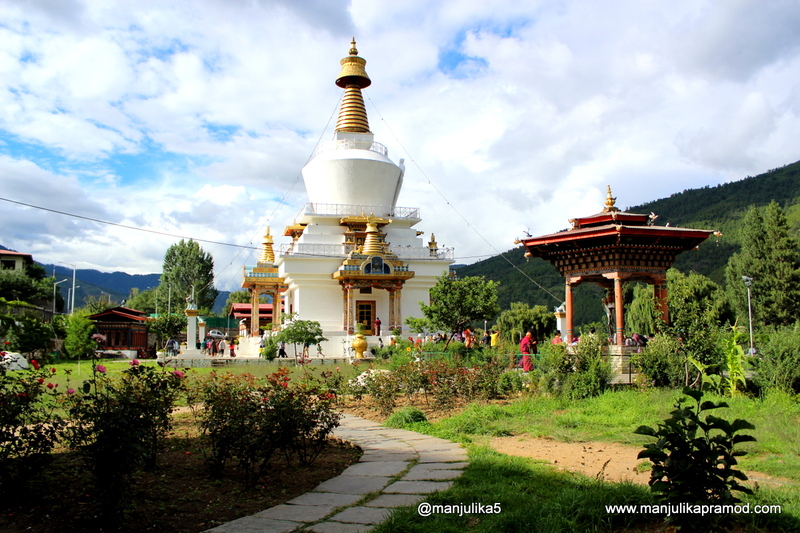 The vivid descriptions of Bhutan ignited my memories of travel through Phuntsholing many years ago while in the Navy:) Lovely description and pictures of Bhutan, Manjulika! Awesome!! Been to Bhutan last February and just loved it!! Mesmerized with facts you shared about Bhutan, its full of greenery and I can feel that fresh air. I have been to Bhutan 2 times and want to go again. Such is the lure of this country! Beautiful place and good photography.. i Guess it is Nikon D5200.. ?? Thank you, Manjulika for this beautiful post. Fantastic photography good experiences you shared. I am also planning to visit Bhutan and contacted a travel agency Bhutan Mahayana Tours in advance. One of my friend has been to Bhutan but she was hardly descriptive about her stay. Now reading this post, I want to visit Bhutan. It goes without saying that I loveee to travel.